SPECTREOUTREACH.com: Roti canai and teh tarik for RM 1! Roti canai and teh tarik for RM 1! "Only three days into operation, Rahim said mamak restaurants in the area have sent a clear message to him to “please maintain the market price of food”. However, Rahim will not budge, because he believes food should be reasonably priced. “I am still making money selling roti canai at 40 sen a piece. I make less compared to other restaurants,” he said. The actual cost of making a roti canai is 20 sen, and by selling it at 40 sen, Rahim says he still makes a 100% profit. On the teh tarik, he makes a profit of 18 sen by selling it at 60 sen a glass. 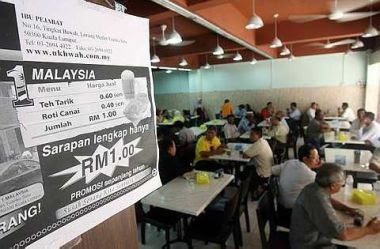 To break even, the restaurant needs RM2,000-a-day or RM45,000-a-month in sales to cover the fixed costs of the RM7,000 rental per month for the premises and the salary of the 16 staff members, who are all locals. “Food is a basic need. I don’t believe one should pay a lot for food. Most restaurants make 200% to 300% profit from selling food,’’ he said. The restaurant operations are also based on family concept."